FUN LITTLE SEAFOOD BALLS! Made with clams, these are a tasty addition to your dinner party. 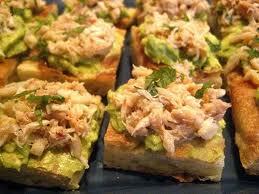 It's crab spread ... yum ! if you like oysters you will love oyster stew. its a fun way to eat them. Spicy seafood cocktail. Perfect for cocktail hour. 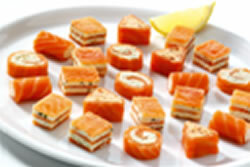 Delicious Smoked Salmon Canapes. Many variations can be made to this simple yet delicious hourderv. Substitute crackers for bread. Use slices of fish. Many possibilities in this one.